We’d love your help. Let us know what’s wrong with this preview of Ten Dead Comedians by Fred Van Lente. Fred Van Lente’s brilliant debut is both an homage to the Golden Age of Mystery and a thoroughly contemporary show-business satire. As the story opens, nine comedians of various acclaim are summoned to the island retreat of legendary Hollywood funnyman Dustin Walker. The group includes a former late-night TV host, a washed-up improv instructor, a ridiculously wealthy “blue Fred Van Lente’s brilliant debut is both an homage to the Golden Age of Mystery and a thoroughly contemporary show-business satire. As the story opens, nine comedians of various acclaim are summoned to the island retreat of legendary Hollywood funnyman Dustin Walker. The group includes a former late-night TV host, a washed-up improv instructor, a ridiculously wealthy “blue collar” comic, and a past-her-prime Vegas icon. All nine arrive via boat to find that every building on the island is completely deserted. Marooned without cell phone service or wifi signals, they soon find themselves being murdered one by one. But who is doing the killing, and why? To ask other readers questions about Ten Dead Comedians, please sign up. In his debut novel, Fred Van Lente does Agatha Christie’s And Then There Were None - but with comedians! And it’s not bad. Many of the characters are thinly-veiled versions of real-life comedians: there’s a Larry the Cable Guy-type, Carrot Top, Ali Wong, George Lopez, and Joan Rivers, to name a few. They’re lured to a private island owned by a famous, rich comic they all have connections to who strangely isn’t there to greet them - and then the comedians start getting killed one by one! And Then In his debut novel, Fred Van Lente does Agatha Christie’s And Then There Were None - but with comedians! And it’s not bad. And Then There Were None (alternately titled Ten Little Niggers/Indians/Soldiers hence Van Lente’s title) is my favourite Agatha Christie novel and a masterpiece but Van Lente, despite being a talented comics writer, isn’t as good a novelist as Christie to make his story as gripping as hers. I think he’s going for both a comedic and thrilling novel and, in splitting his focus on two disparate genres, doesn’t really accomplish either. Whereas with Christie the tension builds until you forget you’re even reading, you’re flying through the pages, Van Lente’s story has a stop/start rhythm to it; sometimes it’s exciting, like when a murder happens, but more often than not it’s kinda dull as the characters stand around wondering what to do. The story is padded out with excerpts from the comedians’ standup routines which were the worst parts of the book. Full marks to Van Lente for trying, and I realise writing genuinely funny comedy is very hard, but, wow, were these passages unfunny - I didn’t laugh once at anything. Maybe that was the point - to highlight the comedians’ hackery - but it didn’t make for entertaining reading either. This book didn't make me laugh. It just made me grumpy. I admire the chutzpah of a debut author doing a homage to the Queen of Mysteries, Agatha Christie, in this book based on And Then There Were None but it never really lived up to its promise. This time the characters brought to the desert island were comedians. Not to worry though, their crimes were they aren't funny and abused their comical abilities. I concur that they are guilty of this. I really don't know what else to say. I think ever This book didn't make me laugh. It just made me grumpy. I admire the chutzpah of a debut author doing a homage to the Queen of Mysteries, Agatha Christie, in this book based on And Then There Were None but it never really lived up to its promise. This time the characters brought to the desert island were comedians. Not to worry though, their crimes were they aren't funny and abused their comical abilities. I concur that they are guilty of this. I really don't know what else to say. I think everyone knows the story of people cut off from humanity and then slowly killed one by one. Who is killing them? Will anyone survive? Does anyone care? If this appeals to you then I would read the original. When you are dealing with unlikable people it needs a special skill to get the reader involved. It doesn't happen here. In Ten Dead Comedians, a text by popular comedian Dustin Walker goes out to 10 comedians, inviting them on a private island to work on a new comedy project together. But when they get there, Dustin is nowhere to be found, they have no cell reception and therefore no way to get off the island and they’re getting killed off one by one. It was very exciting to see how the deaths of every comedian were executed. There were a lot of interesting, creative and unexpected ways for them to die and a lot o In Ten Dead Comedians, a text by popular comedian Dustin Walker goes out to 10 comedians, inviting them on a private island to work on a new comedy project together. But when they get there, Dustin is nowhere to be found, they have no cell reception and therefore no way to get off the island and they’re getting killed off one by one. It was very exciting to see how the deaths of every comedian were executed. There were a lot of interesting, creative and unexpected ways for them to die and a lot of hidden traps that were surprising for both the reader and the characters! Being someone who doesn’t really read mysteries, it was so intriguing! I especially liked the ending of the book! I was so stunned when everything was revealed because it was so unexpected! And I loved the process of the mystery being uncovered and figured out by the remaining characters! It’s such a plot twist when you find out who the murderer is and how everything was planned and executed! I really liked that I was surprised and it wasn’t easy to guess at all! As someone who doesn’t read a lot of mysteries and therefore having nothing to compare it to, I found Ten Dead Comedians to be very enjoyable! I felt like it was well-done and the plot twist was something that nobody could have expected! This was an entertaining homage to Agatha Christie and to old school murder mystery but with a cutting edge and a lot of hilarious happenings. This was a funny murder mystery. It was an entertaining and a quick read. 10 strangers are on a deserted island, the home of legendary comedian Dustin Walker. He has invited them there to work on his latest project. When they arrive, they find the island deserted and their host dead. With no internet or phone service, they have no way of getting off the island. And one by one, they are being murdered. The ways they are killed become increasingly complex, as we try to figure out who is responsible This was a funny murder mystery. It was an entertaining and a quick read. 10 strangers are on a deserted island, the home of legendary comedian Dustin Walker. He has invited them there to work on his latest project. When they arrive, they find the island deserted and their host dead. With no internet or phone service, they have no way of getting off the island. And one by one, they are being murdered. The ways they are killed become increasingly complex, as we try to figure out who is responsible for the deaths, and who, if anyone, will survive. The main story is interspersed with comedy monologues from each of the comedians. I felt the monologues were the weakest part of the story. Towards the end, I just skipped over them. I don't feel like I missed anything. It also seemed that the people weren't taking the threat seriously enough. They didn't seem as panicked as I think I would be. As in all horror movies, people were still going off by themselves instead of sticking together. And being lured to isolated locations. Why are people so stupid? For all these flaws, this was still a fun read. I enjoyed the basic story. The murders were inventive and the ending was satisfying. Just be prepared for characters that you like to die. This is a murder mystery after all. The title of Ten Dead Comedians is going to sound very familiar to anyone with a rudimentary knowledge of murder mysteries. The best selling mystery of all times is Agatha Christie's And Then There Were None which was also titled Ten Little Indians and in its first printing was given the title Ten Little *insert N word*. Fortunately saner heads won out in later years. Fred Van Lent's very funny take-off on the Christie novel can be called a pastiche or even a tribute to th Three and a half stars. The title of Ten Dead Comedians is going to sound very familiar to anyone with a rudimentary knowledge of murder mysteries. The best selling mystery of all times is Agatha Christie's And Then There Were None which was also titled Ten Little Indians and in its first printing was given the title Ten Little *insert N word*. Fortunately saner heads won out in later years. Fred Van Lent's very funny take-off on the Christie novel can be called a pastiche or even a tribute to the classic book but, like all good tributes, it adds something of its own and makes its own statement. Fred Van Lente is primarily known as a writer of comic books and graphic novels. This is his first novel and I guess it is a compliment that it didn't make me think of graphic novels at all. It made me think of someone who has a first hand knowledge of the business of stand-up comedy and the psychological make-up of anyone who wishes to go into that brutal business. I am not sure whether he has that experience but he made me feels like he did. The premise of Ten Dead Comedians, as it is in the Agatha Christie book, involves ten people who are invited to a secluded island for somewhat vague reasons. One by one, they end up being murdered. Since it is established that no one else is on the island, the murderer has to be one of the ten. And we are off to the races. All of Van Lente's unsuspecting victims are comedians. In fact, they are sort of a sampling of comic stereotypes. Some of them are thin disguises of well known comics such as Joan Rivers and Larry the Cable Guy. A few seem to be a combination of individuals. For instance, prop comic Oliver Rees aka Orange Baby Man appears to be a mixture of Carrot Top and Gallagher. Others seem to be more of a capsule of a particular type of comic style than any one person. The use of comic archtypes works well in this story. They shape the characters and their issues. as they play against the mysterious personage of Dustin Walker, a legend who all ten comics have a connection to and the one who invites them to his island. Walker is sort of the McGuffin in the novel. He explains via videotape why they are all there and then kills himself. Guessing the connections to Walker and how he is pulling off this mass extinction of funny people is half the fun. Of course a book like this needs to be funny. But not so funny or outlandish that we lose the structure of the mystery. Intermittent slices of each comic's routines helps us along as we follow this who-will-do-it and who-will-croak-it. All in all it is a clever take-off on a very weird profession. Van Lente offers lots of droll and witty one liners as each comic engage each other in a competition of words and wits. I can't say any one character is very sympathetic but since we are dealing with archtypes rather than rounded characterizations, it tends to work. Čia – šiuolaikinis „užrakinto kambario“ detektyvas pagal Agathos Christie And Then There Were None, tik visi personažai yra komikai. Iš pradžių galvojau, kad netempia iki Christie, bet paskui supratau, kad tempia iš kitos pusės, formuoja ironišką santykį su „aukso amžiaus“ detektyviniu kanonu. Abiejų pasakojimų prielaida ta pati – dešimt žmonių melagingu pretekstu pakviečiami į salą, o tada jau juos ten pradeda kažkas po vieną žudyti. Detektyvuose šie mirtį nešantys kvietimai būna suformuluoti t Čia – šiuolaikinis „užrakinto kambario“ detektyvas pagal Agathos Christie And Then There Were None, tik visi personažai yra komikai. Abiejų pasakojimų prielaida ta pati – dešimt žmonių melagingu pretekstu pakviečiami į salą, o tada jau juos ten pradeda kažkas po vieną žudyti. Detektyvuose šie mirtį nešantys kvietimai būna suformuluoti taip patraukliai, kad būsimosios aukos iškart viską meta ir veržiasi ten važiuoti – iš to galime suprasti, kad į visokias cementovkes prie ežero, įmonės vakarėlius ir mergvakarius nuošalioje sodyboje galima važiuoti drąsiai, nes jei kas ten jus ir nužudys, tai nebent nuobodulys. Tai va, saloje daugiau nieko nėra, taigi žudikas privalo būti vienas iš svečių. Tačiau kuris? Kaip žinoti, su kuo gali pasilikti viename kambaryje, o su kuo – nieku gyvu? Istorija pasakojama iš skirtingų personažų perspektyvų ir jie visi tampa lyg ir savi, be to, kuriamas įspūdis, kad ir tas negali būti žudikas, ir anas negali… Skaičiusiems A. Christie, „Ten Dead Comedians“ pateiktas paslapties išaiškinimas nenustebins, gal netgi įtarsite skaitydami. • Aukso amžiaus detektyvuose apskritai dažnai kuriama baugi atmosfera, bet pats nusikaltimas ir jo išaiškinimas vyksta su tam tikru lengvumu. Išaiškinti nusikaltėliai gana lengvai pasirenka mirtį, su tuo greitai susitaiko ir jų artimieji. Kraujo nedaug, žarnų išvis neregėti. • „Ten Dead Comedians“ – priešingai. Atmosfera lyg ir, kaip čia pasakius, linksma? Komikai šaiposi vienas iš kito, pykstasi, pasakojimą segmentuoja ištraukos iš jų standup’ų. Bet už viso to glūdi baisi (vieno ar kelių žmonių) obsesija. Kas gali būti pajėgus ne tik norėti, bet ir suplanuoti bei įvykdyti daugybės beveik nesusijusių žmonių mirtis? Šioje knygoje personažai juokeliais bando paslėpti beprotybės šešėlį, kurį visi mato, bet bando ignoruoti. Niekas neina „gently into the good night“, visi nori gyventi, bet miršta išsitaškydami gabalais ar kitais bjaurokais būdais. Tai va, visa ta Tarantino-style kraujo bala išryškina keistą "aukso amžiaus" personažų (tiek aukų, tiek žudikų) ramybę ir santūrumą. • Agathos Christie „And Then There Were None“ perosnažai iš pradžių atrodo „normalūs žmonės“, bet netrukus sužinome daugiau ir baisesnių dalykų apie juos. Pasirodo, žudiko sukviesti žmonės nėra tokie jau nekalti. • „Ten Dead Comedians“ irgi kažką sužinome apie tuos personažus, kartais ir kažką blogo, bet – nu ir ką? Ar dabar dėl to reikia juos žudyti? Kaip tik – su tom problemom jie darosi žmogiškesni ir simpatiškesni (gal tiesiog šioje knygoje gerai padaryti personažai, paprastai man visa ta rašymo tradicija „padarykime būrį įdomių personažų, kiekvienas turės po keistenybę, po gerą bruožą ir po ydą“ per nervus važiuoja, kažkaip nu neužtenka pasimatymų šou „Kitas“ dosjė, kad personažai pasidarytų trimačiai: „O, čia Zorkas ir Gorkas, jie dvyniai, bet didesnis mėgsta gėles, o mažesnis mėgsta ginklus, much diversity.“ – niekam neįdomu!). Savvy mystery lovers will recognize immediately from the title what Fred van Lente’s debut is: a modern reworking of And Then There Were None, the Agatha Christie novel originally published with the offensive title of Ten Little Niggers. Which is especially appropriate for this novel for reasons I’ll get to later. Dustin Walker was a comedy legend in his day; however, a series of extremely lucrative but terrible movies has reduced the one time king of comedy to a punchline. Even so, Walker has ac Savvy mystery lovers will recognize immediately from the title what Fred van Lente’s debut is: a modern reworking of And Then There Were None, the Agatha Christie novel originally published with the offensive title of Ten Little Niggers. Which is especially appropriate for this novel for reasons I’ll get to later. Dustin Walker was a comedy legend in his day; however, a series of extremely lucrative but terrible movies has reduced the one time king of comedy to a punchline. Even so, Walker has accrued so much wealth that he now has a Caribbean island to himself with a mansion to match. So when an assortment of comedians — some well-known, some not-so-much — get an invitation from Walker to come to the island, they all respond, hoping that they can profit from what they assume is a comeback gambit. The group includes funhouse versions of Larry the Cable Guy, Joan Rivers, Pewee Herman, a Puerto Rican David Letterman, among others. As in And Then There Were None, the guests find their host has killed himself and then arranged that the rest should die, one by one. As the novel’s title suggests, van Lente has crossed the Agatha Christie classic with a no-holds-barred, profane and often tasteless show-business satire to create a gripping thriller, both funny and suspenseful, a book that kept me reading into the wee hours so I could see how it ended. And worth every lost minute of sleep. Highly, highly recommended. Advertised as being similar to the board game Clue, this murder mystery is about 9 washed up comedians being called together for what they think will be a workshop. They're all so eager to go because the man calling together the weekend away is a successful comedian they all looked up to at the beginnings of their careers. TEN DEAD COMEDIANS by Fred Van Lente is a satirical murder mystery with hints of Agatha Christie and Clue. We get a glimpse into the lives of eight different comedians. They'r Advertised as being similar to the board game Clue, this murder mystery is about 9 washed up comedians being called together for what they think will be a workshop. They're all so eager to go because the man calling together the weekend away is a successful comedian they all looked up to at the beginnings of their careers. TEN DEAD COMEDIANS by Fred Van Lente is a satirical murder mystery with hints of Agatha Christie and Clue. We get a glimpse into the lives of eight different comedians. They're all on the downward slope of their fame and trying to hold onto it. When they all receive text messages from Dustin Walker asking for them to meet with him on his private island, no one hesitates. In true Clue and AND THEN THERE WERE NONE form, the host is found dead. As if that doesn't cause enough panic, the comedians find themselves to be the next targets. The mystery was great. I honestly was shocked at the ending and who ended up being the killer! Well done to Van Lente on putting this classic feeling murder mystery. The chapters were separated by the different comedic monologues from the characters. Those helped show more of the character and each of the monologues ended up including some mention of their idol. The characters were an eclectic group - some old school comedians, podcasters, millennials, a prop comedian, and even some improv. However, I wasn't a fan of a couple of the characters - probably expected given their development. If you want some satire with a dark twist or if you like the old school murder mysteries, then I'd highly recommend this book. If you're a fan of Agatha Christie or Clue you'll also love this. I jumped at this book because it was described to be like the board game! I give this a solid 4/5 stars! In Fred Van Lente's sly update of mystery classic And Then There Were None, ten comedians of varying levels of success and talent travel to a tropical island at the behest of reclusive legendary funnyman Dustin Walker. To the surprise of absolutely no one who's ever even heard the words Agatha Christie, they find the island deserted - except for the unseen killer who stats picking them off one by one. Given that Van Lente is recycling his material from one of the greatest and best known mystery n In Fred Van Lente's sly update of mystery classic And Then There Were None, ten comedians of varying levels of success and talent travel to a tropical island at the behest of reclusive legendary funnyman Dustin Walker. To the surprise of absolutely no one who's ever even heard the words Agatha Christie, they find the island deserted - except for the unseen killer who stats picking them off one by one. Given that Van Lente is recycling his material from one of the greatest and best known mystery novels of all time, I have to assume we're meant to guess our destination and that the thrill is in the journey, which treats us to send-ups of several famous comics as well as the comedy-world in general. I'll admit here and now that comedy is not an area I pay a lot of attention to, so while I could identify the obvious Larry the Cable Guy and Joan Rivers repliques - and Jesus, is that a Gallagher reference? does anyone even know who that is anymore? - most of the other caricatures missed their marks with me. There is, however, no speciality knowledge required to enjoy the series of horror-movie-style murders, which Van Lente has bumped from Christie's discreet PG to a hard R in some places. Interesting modern take on Agatha Christie's original book with a title I can't print here but than titled Ten Little Indians and than even later titled And Then There Were None. Van Lente changes up the original premise by using ten comedians that are being murdered one by one on a island. The ten comedians in the book are thinly disguised characters of some real life comedians which makes the book more fun to read. Not the greatest book I ever read but I found it an entertaining and fast read. A take on the "locked room" mystery, this had about 6 too many characters; I had difficult time keeping them straight and never felt I knew much about them. The solution was clever with a good twist. It's compared to Agatha Christie's AND THEN THERE WERE NONE, and while the plot is similar, take care in recommending to Christie fans as it is a bit raunchy in places. Thanks to the publisher for the advance digital reading copy. So this probably would have been a 3.5 bumped to a 4 if not for the fact I was rather let down that (view spoiler)[ the movie ending was followed, not the book ending (hide spoiler)]. well insomuch as it could be - Lente did a really good job following the cues of AND THEN THERE WERE NONE, adapting the deaths to match some aspect of the Comedians lives (much as Christie adapted the children's ditty), but to make the final punchline stick the Judge character was different. I recently re-skimmed th So this probably would have been a 3.5 bumped to a 4 if not for the fact I was rather let down that (view spoiler)[ the movie ending was followed, not the book ending (hide spoiler)]. well insomuch as it could be - Lente did a really good job following the cues of AND THEN THERE WERE NONE, adapting the deaths to match some aspect of the Comedians lives (much as Christie adapted the children's ditty), but to make the final punchline stick the Judge character was different. I recently re-skimmed this, to finish up my review, and guys...guys its possible I was being too nice earlier. My skin was crawling at points that I marked to revisit for my review. Entertaining little read but the dialogue smacks of a non-comedian trying to write how he thinks comedians would speak. I’m also really curious why Louie CK is thanked in the acknowledgements even though there is a character based on him, who is portrayed in a negative way. When nine washed up comedians, including a late night T.V host, an improv instructor, and a Vegas icon, are invited to the island of a legendary Hollywood funnyman, each selfishly take up the offer. However, once they arrive they find they lack cell phone signal, the island is deserted and a dead body is swinging from the balcony. As the plot progresses, and each member of their party is systematically killed, they must figure out who is doing the killing. A take on Agatha Christie’s And Then Th When nine washed up comedians, including a late night T.V host, an improv instructor, and a Vegas icon, are invited to the island of a legendary Hollywood funnyman, each selfishly take up the offer. However, once they arrive they find they lack cell phone signal, the island is deserted and a dead body is swinging from the balcony. As the plot progresses, and each member of their party is systematically killed, they must figure out who is doing the killing. 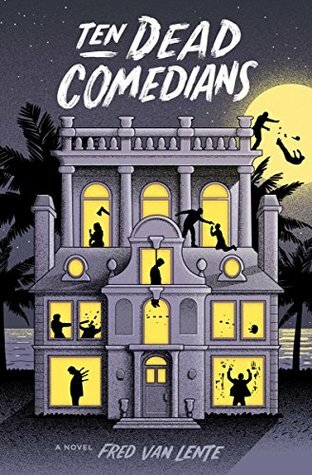 A take on Agatha Christie’s And Then There Were None and elements of the game Clue, Ten Dead Comedians: A Murder Mystery by Fred Van Lente reads like a classic. A partial satire of the genre and an intricately weaved plot made this one stand out from the pack of books releasing this summer. The novel opens with each character being invited to this exclusive island. From here, the book is narrated partially through events on the island, in which different characters are given perspective and also through the character’s various comedy sketches. Although I loved the general narration, I really did not like comedy sketches within the text. I found that it broke it up in a strange way and sort of knocked me out of the mystery. Through dialogue and text messages, the reader is privy to most of the character motivation and to angles of the mystery. I really liked this. Knowing which characters were playing others and trying to guess which ones I could trust made this one continuously interesting and my mind running. I also really enjoyed a number of characters in this one. It really reminded me of those old school crime novels where, truly, anyone could have been the suspect, and, I suppose, that is exactly the point! I also loved how some of the characters were likeable and some of them were absolutely ghastly. It really added some dimension to the pages. I am always impressed when an author is able to balance comedy and tension. I feel like Van Lente does so within his prose. I was left laughing out loud on one page and wincing the next. My largest complaint, and I guess it is quite small, is that this novel is pretty closely mimicked after the Agatha Christie classic; I am not a huge fan of Christie (I know, I know) or “old school” mysteries, so there were parts that I found dragged a little for my own taste. Overall, if you are a fan of comedic satire with a dark twist, this one will highly appeal. Further, if you are a “ride or die” Agatha Christie fan, you may relish in this variation of her classic. I gave it 3/5 stars. It's always good to have goals, and this year I have a goal of trying new genres of books. Back in December (I started this goal a month early), I figured I'd try out a book with some humor. This book, specifically, caught my eye because of its title. I was curious why there were ten comedians, and more importantly, why they were dead. This is a brand new genre to me - aside from some Diary of a Wimpy Kid books when I was younger, I have never read a book focused on humor, so this was a perfect It's always good to have goals, and this year I have a goal of trying new genres of books. Back in December (I started this goal a month early), I figured I'd try out a book with some humor. This book, specifically, caught my eye because of its title. I was curious why there were ten comedians, and more importantly, why they were dead. This is a brand new genre to me - aside from some Diary of a Wimpy Kid books when I was younger, I have never read a book focused on humor, so this was a perfect book for my 2019 goal. Dustin Walker is a comedian. But he isn't just any ordinary comedian, he's a comedian who's made it big time. For his next big project, Dustin has decided to invite nine other comedians (Steve Gordon, Zoe Schwartz, Dante Dupree, Oliver Rees, Janet Kahn, TJ Martinez, Ruby Ng, William Griffith, and Walker's personal assistant, Meredith Ladipo) to his private island near Saint Martin for a weekend, where they can all bounce ideas off each other and have a good time. All eight of them, distracted by how big of an opportunity this is (who wouldn't want to work with the guy that stared in Can't Help Myself, What Just Happened?, and Help! I Married a Cat), decide to take the business trip. There's one catch they discover when they get there - the island is empty and Dustin is dead! But that isn't their only problem, things gradually get worse - they start running out of food, the boat they took never comes back, everyone is getting murdered one by one, and the wifi doesn't work! This business trip soon turns into a death trip. This book may be your typical murder mystery, but I did like the idea of it. I thought Fred Van Lente picked a pretty cool and creative idea for a book. Also, I did think it was well written. It was easy to follow, and it kept my interest. However, there weren't too many other things that stood out to me. It definitely gave me an interest in murder mysteries, though, so I'm definitely going to have to take a look at others. I remember back in ye olden days when I was in college, reps for comedy clubs would invade my classes and pretty much beg us to buy $5 tickets for their shows. This is what came to mind when I read Ten Dead Comedians. Also, this is the second book I've read this year that pays homage, once again, to the illustrious Agatha Christie. I know imitation is the sincerest form of flattery but after awhile it feels less like flattery and more like beating a dead horse. Let's all say it together: No one I remember back in ye olden days when I was in college, reps for comedy clubs would invade my classes and pretty much beg us to buy $5 tickets for their shows. Let's all say it together: No one is going to usurp the Queen of Crime. I'll be honest: I don't like stand up comedy. Are you shocked? I don't like comedy movies. I don't like sitcoms except for the ones I do and can count on two fingers. I don't like comedians, save for a few, and the famous ones I sort of just don't get. It's not my thing. One of my favorite shows is Seinfeld but it doesn't mean I want to see Jerry Seinfeld doing a live show. I think the worst thing about Ten Dead Comedians wasn't that it wasn't very funny. Come on, how can murder be funny? But that Mr. Van Lente, obviously a huge lover of comedy and comedians, insists on making it a bigger deal than it really is and that really made it difficult to suspend disbelief for all the murder and mayhem that takes place on the Caribbean island. For example, when Dustin Walker's groundbreaking comedy special is mentioned (time and time again), one of the comedians notes that every household owns a copy because it is as ubiquitous as the Rubik's Cube. Okay, that was the only time I laughed when reading this book. I don't care if you're the next Richard Pryor or Sam Kinison or George Carlin, there's no way every household in the U.S. of A. is going to own a copy of your comedy special. That's rib cracking, hilariously, raucously laughable. I soon grew tired (really tired) of the comedians hero worshipping Dustin Walker and how amazing and powerful he was in his prime, the Al Capone of comedy because apparently, you can be so powerful as to blacklist a talentless hack and spread the word around town that this hack never be hired again. Is that an oxymoron? A powerful comedian? Is such a thing possible? In Mr. Van Lente's world it is, which made the whole suspension of disbelief even harder to maintain. Nearly all of the comedians were dee-bags and one was a sexual predator in the making but all of them were patently unlikable. I really looked forward to them getting offed more than I should. I had a great time reading Ten Dead Comedians. It's a pretty light and fun read for people who want to be entertained by an old fashioned mystery and laugh a bit along the way. It also doesn't hurt that if you're really in comedy and the minutiae of it, that you're going to enjoy yourself here. As I'm sure you read in several other reviews, the story goes that one of the worlds most famous comedians, Dustin Walker, has invited a handful of other comedians out to his private island with the intent I had a great time reading Ten Dead Comedians. It's a pretty light and fun read for people who want to be entertained by an old fashioned mystery and laugh a bit along the way. It also doesn't hurt that if you're really in comedy and the minutiae of it, that you're going to enjoy yourself here. As I'm sure you read in several other reviews, the story goes that one of the worlds most famous comedians, Dustin Walker, has invited a handful of other comedians out to his private island with the intent to all work on a project together. However, quickly after they arrive, they find out that this was just a plot to kill them all one by one. But who is behind it and why!? I was a little apprehensive about reading this book because there are a lot of books that come out that claim to be funny or comedic and they don't do much for me. Being someone who is more on the side of wanting to learn about a comedians life and upbringing rather than read a book full of their material (I'll watch or listen to the stand up, thanks), I usually can't get into "funny" books. However, Ten Dead Comedians is different. While it offers plenty of silly humor throughout, there is also a lot of good show business stuff mixed in too. Each comedian is based on 1 or some times 2 real comedians and it was really fun to piece who these personalities were as I read about them. Every comedian has their own humor, secrets and relationship with the famous Dustin Walker in some way and it's addicting to keep reading to see what they will reveal next. In between each chapter of the book also lies a bit of every comedians personal information or material which would have been taken from one of there shows. The material ranges from good to expected of that character to just kind of bad (more than likely because of the character). Personally, I laughed the hardest at Dustin Walkers IMDB page. Amongst all this meta-comedy stuff, the book also doesn't forget that it's a murder mystery novel either, so you're getting good bang for your buck here with some laughs and a good old fashioned murder spree! Who doesn't like that? Don't worry if you're not a big comedy fan as I've exposed myself to be. If you're looking for something fun to read with good characters and relationships that's a bit dark, this is a good one to check out. Ten Dead Comedians, by Fred Van Lente, is a contemporary Agatha Christie style murder mystery set on a celebrity owned island in the Caribbean. Hollywood funnyman Dustin Walker invites nine fellow comedians to collaborate with him on an unspecified project, details to be explained during a luxury, weekend retreat. All are excited at this potential injection of energy into their mutable careers and accept. When they arrive it is to discover that they are cut off from the mainland with no access t Ten Dead Comedians, by Fred Van Lente, is a contemporary Agatha Christie style murder mystery set on a celebrity owned island in the Caribbean. Hollywood funnyman Dustin Walker invites nine fellow comedians to collaborate with him on an unspecified project, details to be explained during a luxury, weekend retreat. All are excited at this potential injection of energy into their mutable careers and accept. When they arrive it is to discover that they are cut off from the mainland with no access to mobile reception or wifi. Their host then informs them that they are all here to die, including himself. Lives may be at stake but so are fragile egos. These people have experienced the adrenaline rush of applause, of popular attention, and become addicted. Those who have touched the heady heights of fame may be aware of its disappointments but they still long for its return. They are disdainful of their fellow artistes, especially when compared to themselves. The deaths begin immediately. At first some believe it is an elaborate hoax, a gig in which they are all being played. As the body count increases and the meagre food supplies get eaten everyone falls under suspicion. The writing is a satire on the modern performers of comedic repartee where offence and insults pass as humour. Each character found a niche that got them noticed by agents, some even believe themselves to be funny. The action is offbeat in places, the characters unlikable and at times pitiable, but this is a competent murder mystery. The means of death are imaginative, the reveal of the perpetrator clever even if all is understandably far fetched. As someone who prefers intelligent humour to the more widespread unsavoury crudeness this garnered an unusual degree of sympathy for modern comedians. I may not have found the transcripts from the standup routines amusing, but the pathos portrayed gave the applause hungry entertainers more humanity than their words suggest they deserve. Once upon a time, it was slightly less common for writers to pay what they might call "homage" by reworking the celebrated work of another creator. That's certainly not the case any longer -- and, I'll freely acknowledge, some can do so with a great deal of invention. The challenge is to do right by the original work, showing the proper degree of honor, but also weaving in an original idea of one's own, and (I cannot emphasize enough) matching the quality of the venerated story. A tall order, wh Once upon a time, it was slightly less common for writers to pay what they might call "homage" by reworking the celebrated work of another creator. That's certainly not the case any longer -- and, I'll freely acknowledge, some can do so with a great deal of invention. The challenge is to do right by the original work, showing the proper degree of honor, but also weaving in an original idea of one's own, and (I cannot emphasize enough) matching the quality of the venerated story. A tall order, which is why perhaps it should not be attempted nearly as often as it is. Recreating Christie's And Then There Were None with stand-up comedians - and even adding the delicious prospect that each victim might be offed in a way that corresponds to the individual performance style - sounds promising, does it not? I'll even acknowledge that the story does occasionally get it right. (view spoiler)[A culminating scene -- let me be clear: NOT the final scene -- had a flair that it would have been refreshing to see evidenced throughout earlier chapters. (hide spoiler)] However, most of the characters aren't given enough distinction, and the inset sections that offer samples of their comedy stylings are both awkward in their insertion and remarkable only in how flatly each excerpt lands. Which perhaps brings us to the greatest crime of all: don't set up your mystery with a roster of comedians and then fail to make any part of it funny in the least. A darkly clever take on Agatha Christie’s And Then There Were None and other classics of the genre, Ten Dead Comedians is a marvel of literary ventriloquism, with hilarious comic monologues in the voice of every suspect. It’s also an ingeniously plotted puzzler with a twist you’ll never see coming! So I knew what I was in for - a comedic take on a classic elimination murder mystery. And I wasn't disappointed. The story was simple - a series of text messages are sent out to various comedians, inviting them to a small Jamaican island to take part in the next big thing. No-one is about to greet them, and in each of their rooms is a memento of the past or the future. A video by their host, the great Dustin Walker, accuses them all of crimes against comedy - all are to be judged and no-one is leaving - alive.
" ... a room full of comics turns into a shark tank with one sniff of blood in the water ..."
The story then builds up with each chapter. There are plot twists upon plot twists, the characters are suitable odorous, and you found that you didn't really know which character you should be rooting for to survive the obligatory gruesome end. After receiving a mysterious text message, nine comedians are drawn to an island where they are murdered one by one. A whodunnit that's been done many, many times before, but this time the characters are caricatures of famous comedians, and the only surprising twist is that it isn't very funny. Although it didn't appeal to me, fans of the stand up comedy scene might enjoy the book's gallows humor. i thoroughly enjoyed this camped up rendition of a classic 'who done it'. i was not entirely surprised by the culprit, but i loved getting to him. i also loved the 'happy' ending. this was a delight to read. This was wicked good to me, I amazely enjoyed this reading. An dreadfully humorous take on an original Agatha Christie with an unexpected ending. This review has been hidden because it contains spoilers. To view it, click here. Super easy fun read. It definitely helps if you understand comic terms. The only thing I didn’t particularly love was having to read the stand up bits where each comic insulted Dusty. It seemed a little unnecessary to read. Van Lente was raised by a mystery-loving mother (who preferred Dorothy Sayers to Agatha Christie, but we won't hold that against her) and a wisecracking Woody Allen-lookalike scientist father in what appears to be some kind of genetic experiment to write his first novel, TEN DEAD COMEDIANS, even though neither parent nor the son himself would know it for many years. Van Lente spent his time betwee Van Lente was raised by a mystery-loving mother (who preferred Dorothy Sayers to Agatha Christie, but we won't hold that against her) and a wisecracking Woody Allen-lookalike scientist father in what appears to be some kind of genetic experiment to write his first novel, TEN DEAD COMEDIANS, even though neither parent nor the son himself would know it for many years. Van Lente spent his time between birth and authoring Ten Dead Comedians becoming the #1 New York Times best selling writer of graphic novels like Cowboys & Aliens (the basis of the feature film), Odd is on Our Side with Dean R. Koontz, and the gorily funny Marvel Zombies series.